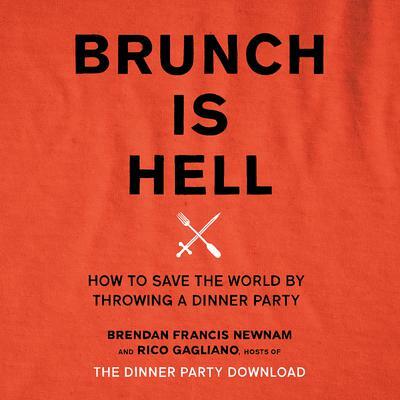 A call to arms against BRUNCH... and a how-to guide for fighting back, from the hosts of the hit podcast and public radio show The Dinner Party Download. Society is under threat. The culprit? BRUNCH. Not merely a forum for overpriced eggs, brunch is a leisure-time-squandering hellscape, embodying all that is soul-killing and alienating about modern life. How to fight back? By throwing dinner parties--the cornerstone of civilized society! Dinner parties--where friends new and old share food, debate ideas, and boldly build hangovers together. If we revive the fading art of throwing dinner parties the world will be better off, and our country might heal its wounds of endless division... all without having to wait in a 9-hour line to eat toast. To that end, BRUNCH IS HELL takes hesitant hosts through every phase of throwing a great dinner party, from guest list to subpoena. Loaded with wit, celebrity advice, and tongue-in-cheek humor--plus sincere insights about how humans can be more generous to each other--BRUNCH IS HELL is a spirited guide to restoring civility, in the bestselling tradition of Adulting, Amy Sedaris' I Like You: Hospitality Under the Influence, and the Bible.